It takes more time to make Sourdough English Muffins than regular English Muffins, but if you like the heartier texture and flavor of sourdough it is so worth it! To make Sourdough English Muffins, you will need a sourdough starter. If you don't already have one going, just follow my easy method at How to Make Your Own Sourdough Starter. Or if you prefer a non-sourdough muffin, try my regular English Muffin recipe instead. Of course, if you bake with sourdough you know that I can't tell you how long to allow for the second rise. Unlike commercial yeast, sourdough starters are all different and never as fast as yeast. That second rise might take 3 hours or it might take 9. Mine took 6 hours. Since I've had my starter going for several months, I can expect these muffins to take about that long to rise any time I make them and plan accordingly. Does that mean you have to check the dough constantly during the second rise? No. Just check it after 2 or 3 hours, then again every hour. And what about the temperature? These are cooked on a griddle, not in the oven, so the temperature takes a bit of tinkering the first time. They need to be cooked at a temperature low enough that they can cook for 10 minutes on each side (so they'll be cooked through) without burning. I use a heavy square griddle on the "big burner" (16,200 BTU) of my gas stove and set it on "2." 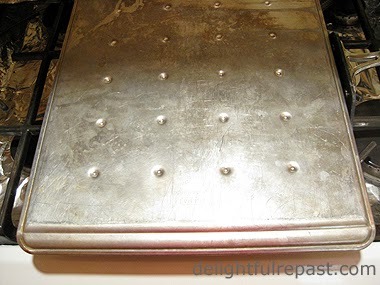 A little trial and error will help you sort it out for your particular pan and stove. I cook the 12 muffins in two batches mainly because I only have 8 crumpet/muffin rings. I think I'll just go ahead and order another box of 4 rings and do them all at once on two griddles and pop half into the freezer. 1 Two days before cooking muffins: Feed up your starter to 1 cup: Take 2 tablespoons starter out of refrigerated storage container. Put it in a 2-cup glass measure. Stir in 1/3 cup flour and 1/4 cup water. Stir vigorously, cover loosely and let stand at room temperature for 8 or 12 hours. 2 Stir down starter and add 1/3 cup flour and 1/4 cup water. Proceed as in previous step. 3 Day before cooking muffins: Stir down fed starter and measure 1 cup of it into 2-quart glass measure. (Should be exactly 1 cup; if over, just add any leftover starter to your starter storage jar.) With a dough whisk or large spoon, stir in milk, melted butter, sugar, salt and 1 cup flour. When all the flour is incorporated, stir in remaining 1 1/2 cups flour 1/2 cup at a time. Stir until dough just comes together into a soft, slightly sticky dough. 4 Using the final 1/2 cup of flour, sprinkle dough very lightly with flour and knead gently, right in the bowl, for a minute, adding only as much extra (over the 1/2 cup) flour as needed to handle the dough. Divide dough in two (I use my digital scale to be precise). Cover and let stand at room temperature for 2 hours, then refrigerate overnight. 5 On baking day: Bring a batch of dough out of refrigerator and let stand at room temperature for 2 hours. 6 Brush griddle very lightly with melted butter. Brush six 3.5-inch / 9-cm crumpet rings with butter and place on the griddle. 7 With greased hands, shape dough into an even log and divide into 6 equal portions* (about 2.75 ounces or 78 grams). Shape into smooth balls and pat into 3.5-inch rounds. Dip in cornmeal to coat both sides evenly. * If you like to be quite precise, as I usually do, weigh the finished dough and divide by 6. 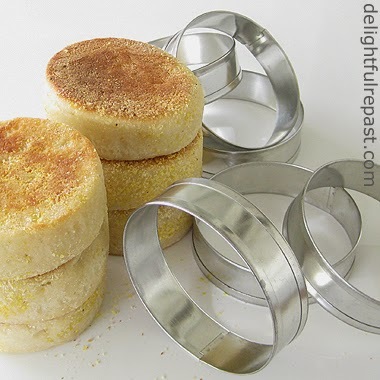 8 Place cornmeal-coated rounds inside rings and press dough to fit rings. Spray a rimless baking sheet with cooking spray, and place over rings. Let rise until puffed and risen to top of rings, anywhere from 3 to 9 hours. * You can make these without the rings, but the muffins will have a more irregular appearance. 9 Uncover the muffins. 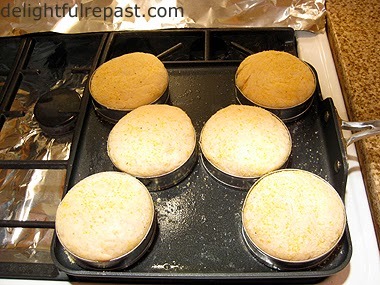 Set the muffin-filled griddle over very low heat and cook the muffins slowly for about 10 minutes until browned. With tongs, remove the rings (or remove the tongs a few minutes after turning, which is what I've taken to doing lately). Turn the muffins carefully and cook slowly for about 10 minutes until second side is browned and muffins are cooked through. An instant-read thermometer inserted into the center of the muffin horizontally should register 200 degrees. 10 Cool on wire rack. Then split with a fork, toast and serve. Splitting with a fork, rather than cutting with a knife, will preserve the nooks and crannies, the unique texture of the English muffin. Disclosure: Some posts contain links to my affiliate account at Amazon.com. If you purchase something from Amazon through one of my links, I receive a small commission, at no additional cost to you, which I use toward the expenses of running this blog. Thanks for supporting Delightful Repast when you shop at Amazon! These English muffins look definitely worth extra work! Well done, Jean. Angie, thank you! And I'm sure they'd work with all those interesting grains you use. Can I ask what dip-and-sweep means please? And I need to understand this 100% hydration aspect, I keep reading it!! Thanks, Elaine! The "100 % hydration" just means that my starter has equal weights of flour and water. The "dip-and-sweep" tells bakers without a scale how to get the same amount of flour I use in the recipe. Depending on how you use the same measuring cup, a cup of flour can weigh anywhere from 4 to 6 ounces. You might find a little more explanation on my About page. If you need more, just let me know. Muffins to the left of me, muffins to the right. Went into the wilderness a couple weeks ago well schooled in your English muffins and American muffins, but now I come back to find I know nothing about sourdough muffins! Had no idea you could wait all night for muffins to rise (the sun rises in the yeast). Sort of like people sleeping all night before they rise. The point of which escapes me. I don’t eat muffins. That said, your usual inimitable style always carries the day. If I were to eat a muffin – just sayin’ – it would be English. That one looks like it has a greater capacity to be engorged with melted butter. Yum, Yum. Thank you, Sully. And I'm with you on the butter. When it comes to butter, I say Go Big or Go Home! Just the thought of these bits of heaven is making me swoon! Oh, Jacqueline, that's just how I feel about good bread, but I never thought of it in those words! Mean, these look wonderful! I had just been thinking about sour dough starter, having tended one years ago. I think I need to do it again. Thanks for the link to the post on how to get the starter started! Thanks, Judy! I hope you'll get a starter started soon! I think my way of maintaining and using a starter is the simplest way AND with no waste. I don't understand why some people store huge amounts and then discard half every time they bake. Not necessary! Greg, thank you! And I like the way you put that! Elaine, you are so welcome! Good morning, lovely lady! It is such a joy to have you share your delicious recipes with Roses of Inspiration - thank you, my dear. How I love English Muffins! I have never made them myself, but I am sure they taste divine. Stephanie, thank you so much! Of course, I judge everything on how well it goes with a cup of tea! Hello Jean! I'm visiting from Roses of Inspiration today! I've never tried English muffins, but I just love working with sourdough... I made sourdough pancakes a little while ago, and I was so impressed with flavour and texture! These look very good and certainly worth a try! kelly-Anne, thank you. I hope you'll try these soon and let me know how they turned out for you! 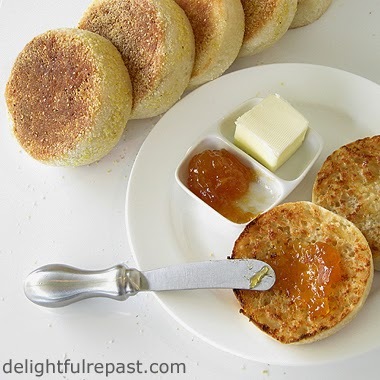 Looks delicious, Jean sourdough english muffins will my next in do list,Thanks for sharing with Hearth and soul blog hop, pinning and tweeting and sharing in google plus. Swathi, thank you so much. Do let me know when you try English muffins. I love hearing about people's experiences with bread and bread-y things! Good morning, my dear! 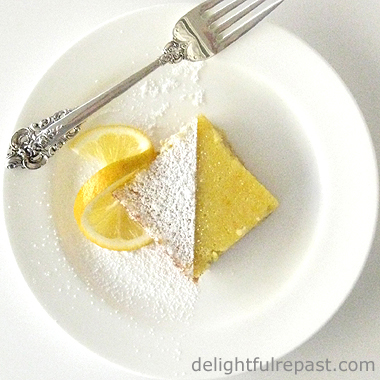 I wanted to pop in and let you know that this delicious recipe was featured at Roses of Inspiration. Thank you so much for linking up and sharing your loveliness with us. Have a great day! Stephanie, thank you! I'll head over there now and check out all the other loveliness! Hello, Thank you for your blog and recipes...It inspires me. I am baking the Sourdough English Muffins. I am confused about the measurement of the flour...the recipe has 3 cups of all purpose 'dip and swipe'/15 ounces/283 grams. I am a 'newbie' baker, but I usually weigh my flour in grams. I decided to weigh 1 cup of 'dip and sweep' and it came out to 146 grams. This did not make sense. Checking on the internet, 15 ounces equals a bit over 425 grams. I will use ounces to make the muffins, but I thought that you may want to check the gram weight again. Thank you again for your contribution to better cooks and bakers! Altalydia, good catch! Thank you so much for catching that typo! I'm going to make the correction the moment I post this reply. Apparently I was thinking of the gram equivalent of 2 cups/10 ounces when I was typing that post. I hope the muffins turned out well for you. Pomme Rosti - Hash Browns with an Attitude?